The strategy on its start gets last 10 bars over the designated period and gets the maximum High price of those bars. Consider an elaborated previous example which also finds the lowest low value over the given candle interval. 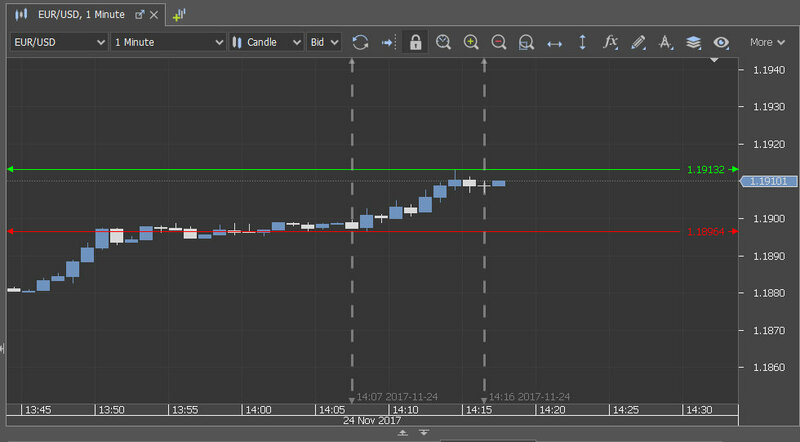 The strategy also draws two price markers that correspond to the prices and two time markers to show the time interval. Consider a strategy which finds the 1 hour bar with the maximum value for 7 days, starting from a given date. Also the strategy demonstrates how to retrieve historical data in chunks, instead of loading all the data at once (which in more extreme cases might lead to performance problems or even an Out of memory exception). * The strategy demonstrates how to retrieve historical data in chunks, instead of loading all the data at once. * the designated start date in startDateStr. order close (checked with history orders). Last transaction time and amount. Transactions over a given time period. * The strategy prints order transaction history over the selected period. since they are the only ones that affect balance. For performance reasons the platform of bigger renko brick sizes (greater than 4 pips) does not assemble the bricks from ticks, but rather from bars. The following strategy shows how one can assemble one's own renko bars from ticks for multiple instruments over a custom period and write them to a file - renkos for each instrument get written into a separate file. The strategy uses asynchronous tick reading methods, meaning that all data reads take place in parallel - in different threads. Also the used approach is memory-efficient, since the strategy works only with one tick and one renko bar at a time, as opposed to cases, when ticks get loaded by IHistory.getTicks over big intervals. Note that the renko assembling algorithm is simplified, thus the results differ from the ones of the platform. * renkos for each instrument get written into a separate file. * reads take place in parallel - in different threads. * when ticks get loaded by IHistory.getTicks over big intrevals. * differ from the ones of the platorm.